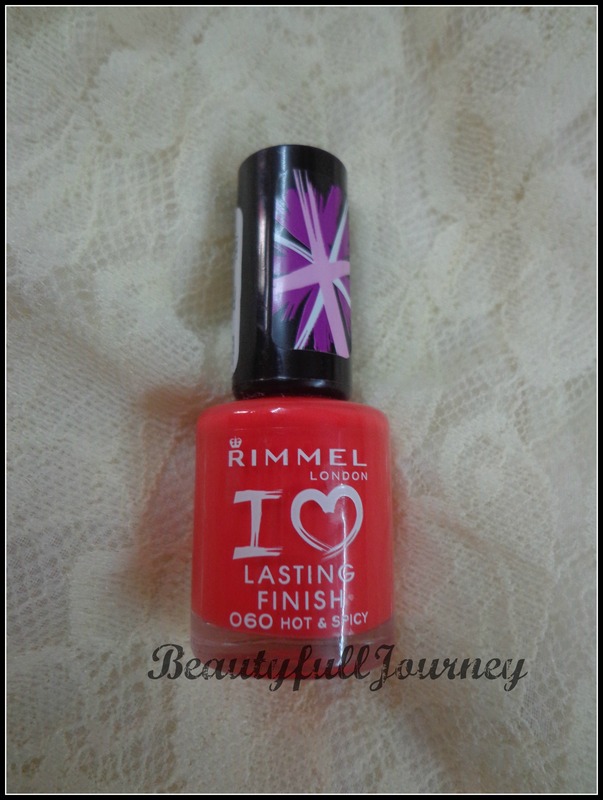 Rimmel London I Love Lasting Finish Nail Paint. Fun! Fresh! Funky! All the on trend colours you need! The BEST shades, the FUNKIEST shades! And they’re long lasting! Make your nails rock in the brightest, boldest shades. It’s hard wearing, daring fashion at its best. Great funky pack! Super Value! Amazing impact! I bought this nail paint from Slassy last week. I wanted the Disco Ball one but it was out of stock. And Slassy has an offer of getting Rs. 250 discount on orders above 1500 and I wanted to avail that so I added this nail paint to the cart. And I don’t regret it a bit. 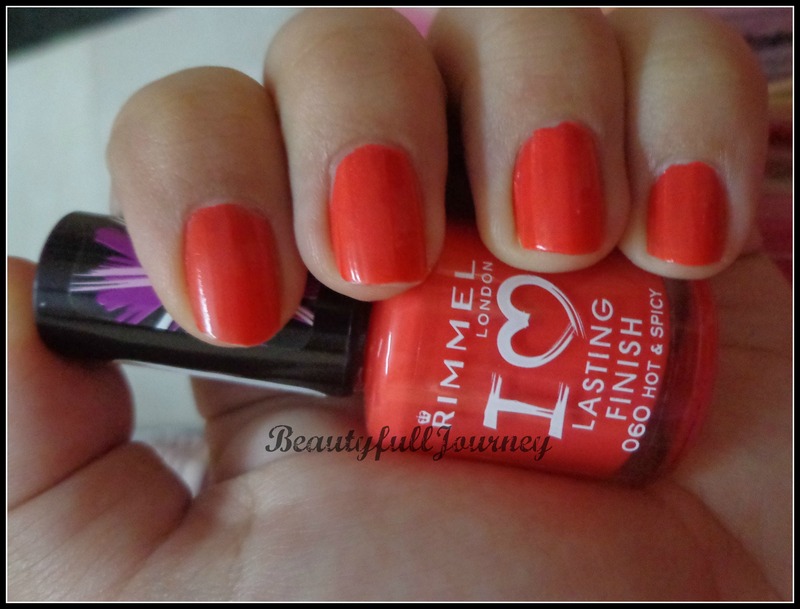 While ordering the nail paint, I imagined the shade to be a pretty coral but it’s actually a reddish-orange but it’s very pretty nevertheless. The bottle of the nail paint is a simple bottle. 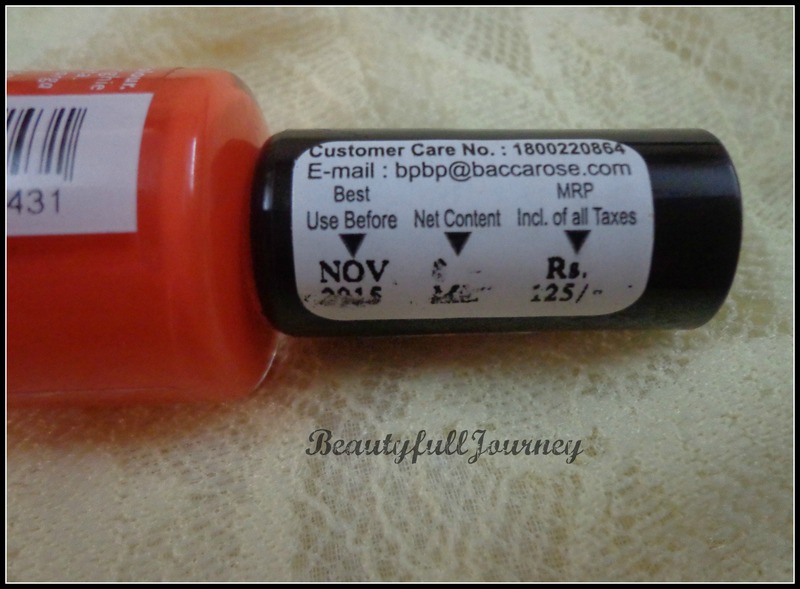 It contains 8ml of product and at Rs.125 I feel it’s very decently priced for that amount! 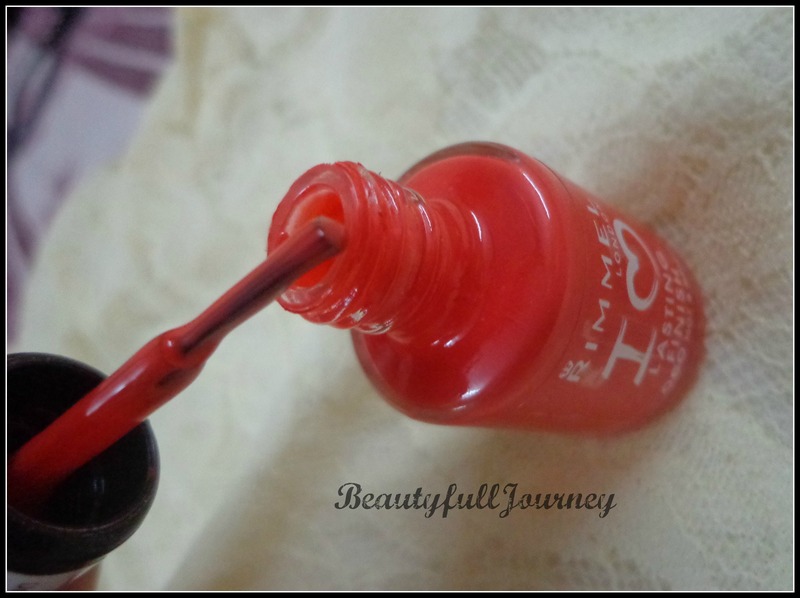 The brush of the nail paint is something I love, it’s perfect and gives an even coat without going streaky at all. Even the consistency of the nail paint is such that it goes on very smoothly and is not at all streaky. The nail paint also dries quickly within 1-2 minutes maximum. Hot & Spicy is a very pretty dark orange shade, I’m completely in love with the shade 🙂 it’s just perfect for summers! It goes on opaque in one coat and 2 coats give a lovely finish. In the pictures I am not wearing any top coat. The pictures were taken 4 days after application and as you can see the finish is still glossy. Also, there is minimal chipping after 4 days. 5) Good consistency – dries quickly, not streaky. 6) Stays perfect for 5 days easily. < Previous Lotus Herbals Safe Sun SPF 100 Launch Event – Pictures, Details. Next > REVIEW: Lacto Calamine Deep Cleansing Face Wash.